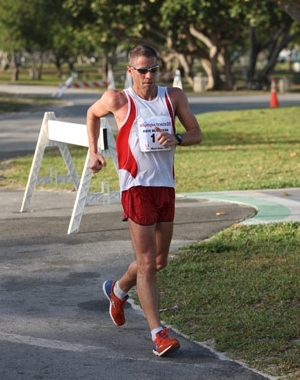 Dave's World Class Racewalking racing team competes throughout the US and the world over in open and masters competitions. We have members of all ages and all abilities. All you need to do is register as a member of World Class Racewalking with USA Track & Field. 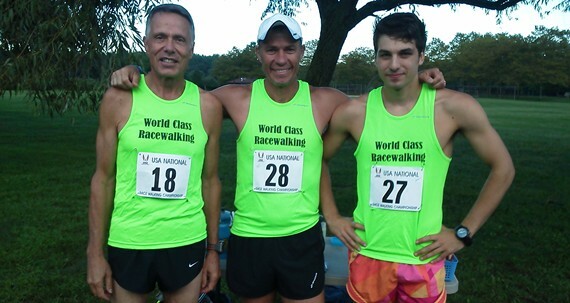 If you are already a member of your local USATF association, just send an email with your name, USATF number, and date of birth to USATF asking to change your membership/club to "World Class Racewalking" in the Long Island Association. Members of the World Class Racewalking Racing Team receive a 15% discount at RunningWarehouse.com, which consistently offers some of the lowest prices on racing flats on the web! Contact Dave for the team discount code. Brooks fan? Members of the World Class Racewalking Racing Team also receive a 40% discount on anything at BrooksRunning.com(!) Contact Dave for the team discount code. Purchase World Class Racewalking apparel in our store! "The Road to Ocho+1" follows Dave in his unprecedented quest to qualify for his 9th US Olympic Track & Field Trials in 2020. Technique; physiology and training; psychology; "other stuff you need to do"; competition; and "loose ends". Everything you need to successfully walk a marathon: History, technique, physiology and training. Wednesday evenings at 6 p.m. at the Friend's Academy Track in Locust Valley, NY.